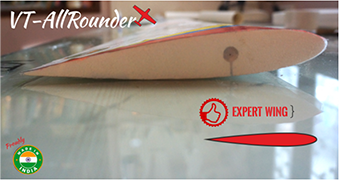 Replacement or add-on Expert wing for our VT-Allrounder. A fully symmetrical tapered airfoil allows the airplane to be flown fast, and can perform advanced pattern maneuvers like outside loops, four point rolls and even rolling circles with ease. Note: This is the wing set only. Designed to be used with the VT-Allrounder fuselage. Replacement or add-on Intermediate wing for our VT-Allrounder. The intermediate wing features one of the most famous airfoils known in RC history – The Clark Y airfoil . Note: This is just the wing set only. Designed to be used with the VT-Allrounder fuselage. Replacement or add-on Trainer wing for our VT-Allrounder. A proven high lift trainer airfoil, Aquila airfoil, lets you fly the airplane with only 3 channels. High lift and low wing loading ensures the plane flies as slow and predictably as possible aiding in quick learning .